When the World Science Fiction Convention was last held in Kansas City, Missouri, the guest of honor was Robert A. Heinlein, the Hugo Award for Best Novel went to Joe Haldeman’s The Forever War, and producer Gary Kurtz and actor Mark Hamill were on hand to promote an upcoming movie that was still billed by many sources as The Star Wars. In August, when the convention returns to Kansas City for the first time in thirty years, I’ll be there. To be fair, Haldeman and Kurtz will also be back, along with the likes of George R.R. Martin, and the fact that I get to attend this particular year seems like an auspicious sign. It’s Heinlein’s hometown, for one thing, and because it’s so close to the University of Kansas, it means that the annual Campbell Conference—an academic gathering named after you know who—will occur at the same time. 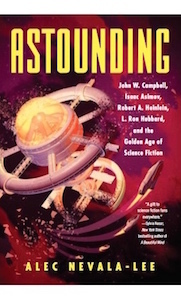 After the attack on Pearl Harbor, John W. Campbell, the editor of Astounding Science Fiction, turned down the chance to enlist at the Philadelphia Navy Yard with Robert A. Heinlein, L. Sprague de Camp, and Isaac Asimov. Instead, he forwarded defense ideas from his authors to Murray Leinster at the Office of War Information; ran the writing factory that cranked out classified sonar manuals at the Empire State Building; brainstormed responses to the kamikaze threat with Theodore Sturgeon and L. Ron Hubbard; and was investigated by the military for publishing a description of an atomic bomb over a year before Hiroshima changed science fiction—and the world—forever. Writers of the Past: Retro Hugos in Perspective. Wednesday, August 17 at 4pm. Seeing the nominees for this year’s Retro Hugo awards brings a flood of recognition and familiarity for some, and a blank look from others. Join us and find out about the professional authors of the period, and the context for the year 1941. Who was just starting out? Who were the Grandmasters of the day? Which giants in the field were still journeymen in those days? Why are they still important? Moderator: Bradford Lyau. Panelists: Alec Nevala-Lee, Shahid Mahmud. Remembering the Futurians. Thursday, August 18 at 1pm. Jack Robins, who died last year, was a founding member of the Futurians. The Futurians were instrumental in not only laying the groundwork for many fannish traditions, but also included the authors of many of the seminal works in the field from Asimov to Pohl, Kidd, and others. Let’s take a look back at their influence during a magical era when the future of science fiction and fandom was taking off. Moderator: Mark L. Olson. Panelists: Alec Nevala-Lee, Pete Balestrieri, Scott Edelman. Do Heinlein Juveniles Stand Up? Thursday, August 18 at 2pm. Robert A. Heinlein published 12 books between 1947 and 1958 that were aimed at young adults, predominantly in the male SF market. Although many older fans have a tremendous regard and nostalgic glow for Heinlein’s juveniles, can children today enjoy them or do they seem hopelessly dated? Let’s take a dive into these books and cast an appreciative yet critical eye over them. Moderator: Dr. Janice M. Bogstad. Panelists: Brendan DuBois, Dr. Marie Guthrie, Dr. Michael Levy, Alec Nevala-Lee. Old Time Radio and New Tales in the Age of Podcasts. Thursday, August 18 at 5pm. The classic era of radio saw science fiction shows X Minus One, Stroke of Fate, Dimension X, and others. Podcasts often use classic storytelling since many other tales from the era of Weird Fiction are out of copyright; however, there are other, newer stories that lend themselves extremely well to podcast readings. The panel discuss old and new ways of using podcasting to tell classic stories well, and bring new stories to life. Moderator: Julia Rios. Panelists: Jim Freund, David Truesdale, Alec Nevala-Lee, Tamora Pierce. Classics in the Corner. Friday, August 19 at 11am. So much new fiction is being published, both traditionally and self-published, that nobody can read it all. But is anyone still reading the classics from the ’40s, ’50s, ’60s, and ’70s or are they just filling up space on the shelf? Why should or shouldn’t we continue to read them, especially when they make us wince with sexist and racist language? Has the move toward diversity and inclusion reduced our tolerance for different eras, even when reading with a critical eye? Moderator: Don Sakers. Panelists: John Hertz, James Minz, Betsy Mitchell, Alec Nevala-Lee. Techno-Thrillers. Saturday, August 20 at 5pm. Techno-thrillers can be an exciting blend of literary genres that combine science fiction, crime drama, spy stories, thrillers, etc. They can be set in outter space or take place here on Earth in the not-so-distant future. What makes them special? What sets them apart? And are they dressed up space operas? Moderator: Toni L.P. Kelner. Panelists: Greg Bear, Edward M. Lerner, P.J. Manney, Alec Nevala-Lee. If that weren’t enough, I’m also going to be taking part in a group reading on Friday, August 19 at 12pm featuring authors from Analog Science Fiction and Fact. Editor Trevor Quachri will be there, along with former editor Stanley Schmidt and writers Ken Liu, James Van Pelt, Alvaro Zinos-Amaro, and yours truly. (I’m hoping to read a page or two from my upcoming novella “The Proving Ground.”) All told, it promises to be a great weekend, and if you’re planning to attend, please drop me a line or keep an eye out for me when you’re there: I’m eager to meet and listen to everyone who wants to chat about the past and future of science fiction, the four writers featured in my book, or really anything at all. And if we’re lucky, MidAmeriCon II will be one of the few sequels that lives up to the hype.